Previous post: Naomi Campbell is at it again – On an Airplane! If you’re a flight attendant, or an aviation enthusist, you probably own a lot of airline crap. Like me. Of course we don’t refer to it as crap. Oh no, these are our treasures. Precious treasures. That belong in a museum. Like the one I have in my guest room closet. Though The Husband has been known to add a few things to my museum from time to time, he’s now ready for the museum to close. For good. Forever. Because he wants the damn closet back. Why? Because there’s more crap…I mean treasures…to add. Like the stuff I found at World Market yesterday while I was wandering around wasting time while the tires on the mommy mobile got rotated next door. 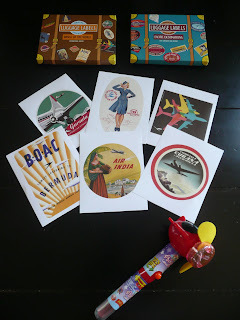 I was on the search for solar twinkling garden lights when I ran into four boxed sets of travel luggage stickers. Oh my god, they were cute! I had to have them. And then I saw something else I had to have. 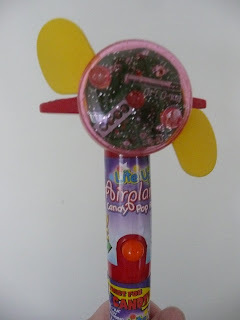 A lollipop/fan/light up airplane. Time for a basket. Of course I filled the thing up. With doubles. Of everything. In case I needed to…share. Ya know, for like flight attendant birthday gifts…or something. Before you jump into the car to do the same, because I know you will, which is good, because you really should…do you think you could pick me up some coffee? And perhaps another box set of stickers. I don’t care which box. Any box will do. Ya know…in case I lose a box…or something. Thanks. OMG! !I have the matching diary to these! !